This proposal was made following the Foundation’s invitation to produce this work. Unfortunately the project was eventually halted due to a lack of funds. Introduction Making Terminator into a substantial, powerful artwork necessitates a development in its scale. Ideally, the final work should be on a scale somewhere between a human being and a tree, with a height of around 4-6m. Working on this basis, I have set out a revised budget. Description Terminator continues my established practice of making ‘dissected’ map sculptures. Previously, I have taken paper maps and cut away everything from them except one particular visual element. This is then presented as a three-dimensional sculpture. Terminator develops this approach by being a construction from a re-drawing of a map, rather than being a dissection of a particular map. The source is the ‘intercity’ rail map from 1991. The outline of the routes from this map has been extracted and re-drawn to form a cut out ‘picture’. This serves as a template for the physical cutting of the shape from sheet metal. The thickness of the sheet has the effect of making the final cut out function as an extrusion of the drawing. The cut out shape is then hand curved, coated black and presented as a self-supporting sculpture, with a change to the map’s original orientation. The convention of placing north uppermost has been dispensed with and the sculpture stands on three ‘lines’ that were previously ‘at the top’. The stations and text have also been omitted. By interfering with these important conventional details, the map’s original utilitarian function has been denied and its shapes have been transformed into something more pictorial. It is a sort of hybrid; an ‘image-object’. The original source presented two-dimensional dark bands on a white ground, where the outline edges of the image are a one-dimensional interface between legibility and blankness. 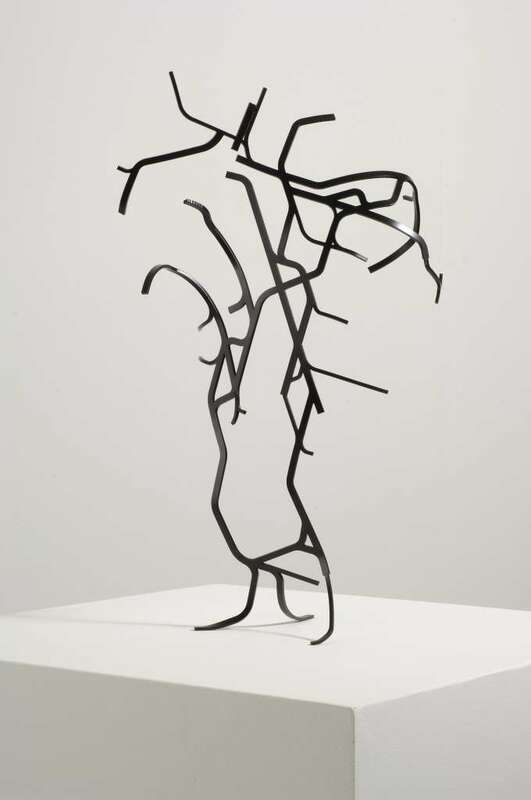 Terminator takes this one-dimensional junction and draws it as a two-dimensional outlined form, which has been extruded and presented as a silhouette that flows through space. The terminator is the dividing line between night and day on the surface of a planetary body. It delineates the junction between light and darkness, the edge defining what is seen. 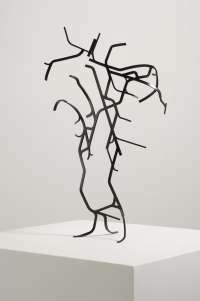 This sculpture is completely defined by its edges, where the image and the object come to an end. 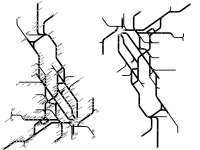 Its physical extremities are bounded by where each depicted route terminates. Size, materials and techniques The existing maquette represents the full sized Terminator on an approximate scale of 1:10. The final work will stand approximately 4m tall. It will be made from water cut 25mm thick mild steel S355 plate, which will be hand curved, zinc sprayed and liquid painted in black, to the same finish as the maquette. 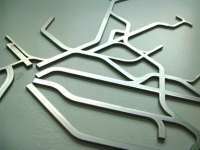 These materials have been chosen on the basis of their resistance to corrosion, which is an important consideration for a piece with such slender sections. The satin black finish emphasises the work’s silhouette appearance. Because of its size, the work will be cut from two separate steel plates, which will be joined together before hand rolling. The scale of the sculpture in relation to the thickness of the sheet material from which it is cut maintains the proportions of the maquette, where the width of the thinnest ‘lines’ of the source equal the thickness of the sheet. This gives them a square profile, making the sculpture a truly three-dimensional rendering of the map. 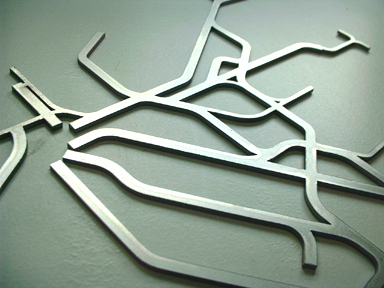 The production of the maquette required the laser cutting of sheet mild steel. A CAD vector drawing was made of the map, which was scaled to the correct size and was used to instruct the computer that controlled the cutting machinery. The same drawing will be scaled up to full size for the production of the final sculpture, which will therefore be proportioned in precisely the same way as the maquette. The water cutting technique used for the final piece produces minimal distortion of the cut material and is preferable to laser cutting, which causes the material to move slightly as it heats, causing the tiny inaccuracies in some of the cut curves visible on the maquette. Terminator requires very clean edges and, mechanically, benefits from being cut from continuous sheets. The process of making the maquette shows that this is the best solution for the successful realization of the project. Manufacture The fabrication of the piece will be sub contracted to [sub contractor details removed]. I will personally oversee the hand rolling (curving) of the cut pattern. From the date of commission, the principal work will take approximately 8-12 weeks. Site works Efficient anchor points for the work and methods of foundation are to be determined by structural engineers during the development of the work. It is likely that the work will require substantial concrete foundations, but these will be dependent on its final location. It may also be necessary for lifting equipment to gain access to the installation site. An ideal site for the work would be one where it could be seen against a backdrop of the sky. I have no particular preference for a specific site at this stage and would like to develop this further if Terminator is commissioned, but the work would not be suitable for siting in woodland, for example. I would oversee the installation and would work alongside technicians from the sub-contractor. Health and Safety Even when constructed using a plate thickness of 25mm, the slender forms of the piece and the turning forces acting upon it may mean that it is not entirely vandal proof if someone climbs it. Under these circumstances it may deform. Appropriate signage and/or barriers would be required to protect the work and the public. The scale and weight of the piece, including its foundations effectively make it theft proof. The development and manufacture includes an engineer’s report, which would provide a definitive analysis of these issues. The work has a minimal wind profile and would adequately withstand the elements. I will take reasonable care for my personal health and safety and of other people who may be affected by my acts during the commission. High standards of health and safety will be complied with during the manufacturing process at the sub-contractors as well as during the installation of the piece. A note on copyright The appropriation of an existing design or drawing, with regard to copyright in the UK, falls under the definition of quotation. In order for the use of such an image to create a new copyright for the appropriating artist, the new work must pass the UK law's originality test. This requires that the appropriating artist ‘adds substantially more of their own independent skill and labour' for the viewer to see, than remains to be seen of the original work. Copyright works which are also 'industrial designs' i.e. 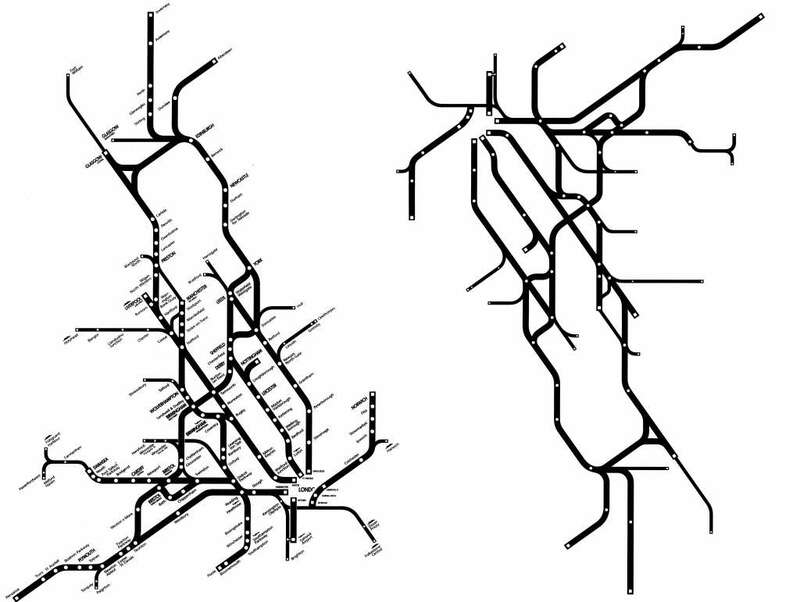 drawings used or intended to be multiplied by an industrial process (such as the 1991 intercity rail map) have copyright protection of 15 years only. The 'Design Right' is given to all such designs and lasts for 5 years from the creation of the design, and then for 10 years after its first making and marketing.